Tinctures are made by extracting, and preserving, the active properties of herbs using alcohol. In early times, this was accomplished by boiling the herb in wine. Tinctures have a stronger action than infusions or decoctions and can be made with fresh or dried herbs, but some herbs may require different strengths of alcohol (15-90% proof). DO NOT use industrial alcohol, methyl alcohol, or rubbing alcohol (isopropyl alcohol). To make non-alcoholic tinctures, replace the alcohol with vinegar or glycerol. 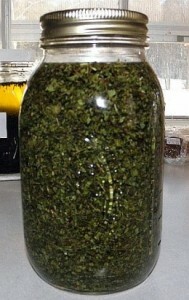 To make larger batches, a basic simple recipe: Fill sterilized jar half full of dried herb. Cover with vodka. Add enough water to fill to just below rim of jar. Add more water if necessary after a few days if herb is not still immersed in the liquid. Place the herb in a large, clean, glass jar and cover with the alcohol. Close the jar and label. Shake well and store in a cool, dark place for ten to fourteen days, shaking the jar every one or two days. At the end of that time, pour the mixture into a wine press or cloth bag and express the liquid from the herb. Discard the herb. Pour the tincture into clean, dark, glass bottles and close the bottle with a cork or screw top lid. Label. Tinctures will generally keep 5 or more years. 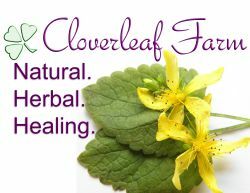 You can purchase a tincture kit on our Cloverleaf Farm Store site which includes your selected herb, instructions and other items needed to make a tincture. In some cases, a tincture made from alcohol is unsuitable or undesirable as an herbal remedy. Such cases include pregnancy, gastric or liver inflammations, and for children or recovering alcoholics. It also includes those who choose not to take alcohol of any kind in any amount, including that found in vanilla extract. For these people, a non-alcoholic tincture is prescribed. Put the tincture dose usually 20 drops into warm water in a cup and leave uncovered for five minutes while the alcohol evaporates. Another method is to use vinegars rather than tinctures. Organic apple cider vinegar or wine vinegars are the most versatile. They contain acetic acid which helps to preserve and extract the essential ingredients of herbs. Place herbs in a wide mouth glass jar and cover with vinegar. Cover and store for a minimum of two weeks, although some prefer to leave it for one or two months, in a cool, dark place, shaking every day. Strain off liquid and bottle. The vinegar should be left for another two weeks before using. Herbal vinegars can be taken internally in the same way as tinctures; or they can be added to salads, soups, or as an ingredient in pickles. Externally, they can be added to bathwater or used as a lotion or hair rinse. Combining apple cider vinegar with elderflower, for example, makes a good remedy for itchy skin.